Karlín neighborhood offers lots of new and interesting concepts for food. One of them is Garage. Garage’s speciality is the typical Canadian meal called poutine, which is made with French fries with a special kind of squeaky cheese and poured over with tasty brown gravy. They offer two sizes in Garage and even the small one is enough for a quick and tasty lunch. 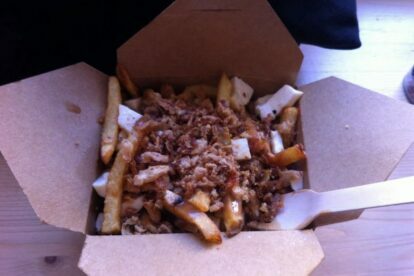 You can choose from 3 kinds of poutine plus there is always the daily special poutine. I prefer the classic one and never forget to add special home made mayonnaise or bacon salt (even salt tastes better with bacon). What I find exceptional about Garage is that it’s a small family owned place so they do their best to keep you satisfied and the atmosphere is very cozy. Just be careful at what time you go there as the opening hours are quite tricky and it happened to me several times that I arrived just when they were on a break. What I do to enjoy it even more is that I grab my paper box full of fries and go to the park on Karlínské náměstí nearby and just feel like a real Canadian for a while.